Is this the final Bryant & May adventure? Well, I hope not, having only just discovered them. But if it is, I can console myself with the fact that I haven’t read the previous eleven books in the series. I’m not usually one to dive in to a series out of sequence – I like to start at the beginning and work through all other existing books first – and I admit I was a little nervous that there would be too many in jokes or references to previous cases or people for me to follow this twelfth case but I needn’t have worried at all. I found it easy to get a handle on the characters and their different traits without it ever feeling as if Christopher Fowler was regurgitating information he’d given readers in his earlier books. Bryant & May’s twelfth case is both topical and timely: a bank collapse and insider trading are going on behind boardroom doors while someone plots a series of murders under cover of protests and rioting on the streets of London. I enjoyed the contemporary storyline and cultural references very much but especially liked how Christopher Fowler enriches these with Bryant’s historical facts and anecdotes. It gave this reader a real sense of how a city like London changes and adapts while retaining elements of everything it’s been through; that a city is made up of its lifetime of experiences, just as we are. I also really liked that Christopher Fowler achieves just the right balance between telling a convincing and gripping story and keeping the reader guessing as to who was behind the deaths, and why; the quirkiness of Bryant, especially, and May, and the unit of oddball detectives with whom they work; and his rich humour, which seems so casual and offhand but cuts right to the quick and mocks our modern society. The Burning Man works really well as a stand-alone but I’m willing to bet that you’ll probably want to read more about the Peculiar Crimes Unit and the eccentric pairing of its senior detectives Bryant & May as soon as you’ve finished reading it, if, like me, this is your introduction to that world. I’m happy to have finally found time to read one of the series while also being a little frustrated that I didn’t come to the series earlier. On the plus side, I have a whole eleven cases to keep me out of trouble until such time as Bryant & May’s next case lands them in some. Happy Reading! 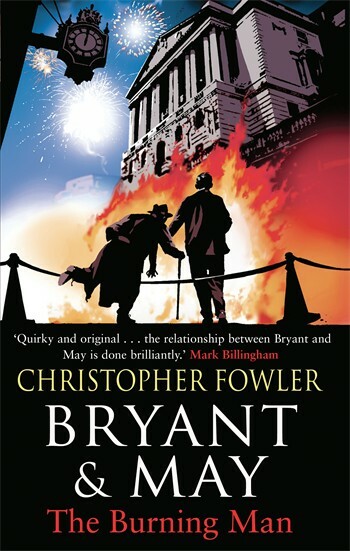 Bryant & May: The Burning Man is the twelfth novel in Christopher Fowler’s series of books about the Peculiar Crimes Unit detectives and is published by Doubleday. To find out more about Christopher Fowler visit his Author Website or Follow Him on Twitter. I just found your review and would like to thank you for being so considerate. The best reviews come from bloggers who take the time to actually read books (I know it’s difficult for the press to do the same because of space restraints) and it gives me the spirit to keep going. This year I won the Dagger In The Library for the series, so I’m thrilled with its reception.